Reports in Causeview are highly customizable and flexible, and can draw on any information saved into the Causeview application. While adjustments can be made to existing report templates while running the report, sometimes you will want to create a report drastically different from the existing report templates, which requires the use of the report customization interface. The report customization interface can be accessed in two different ways - either by customizing an existing report template, or creating a new custom report. You can open the report customization interface by simply clicking on the “Customize” button inside an existing report template. This is useful if you would like to add or slightly change the input data on a template, but you aren’t able to do so with the adjustments in the open report view. If you would like to create a report that is significantly different from any existing reports, you can create a new custom report using the “New Report...” button at the top of the Reports page. This will open the Create New Report page. In the Create New Report page you will find a searchable list of folders with generic report types. 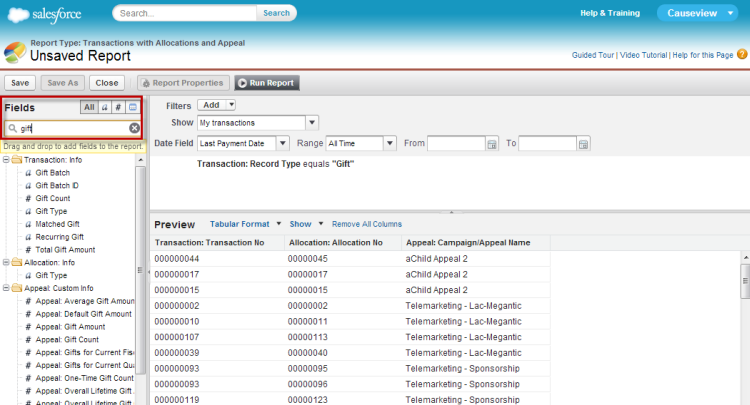 Each report type combines information from different Causeview entities - items like Allocations or Individuals. For example, if you want to run a report on recurring gifts, one report type would offer all saved information about individuals who have recurring gifts, and all saved information about those recurring gifts. A different report type would offer all saved information about transactions connected to a recurring gift, and all saved information about those recurring gifts. Selecting a report type may be a trial and error process while you become comfortable with the report creation interface. Click on your chosen report type and then click on the “Create” button in the bottom right corner of the page. 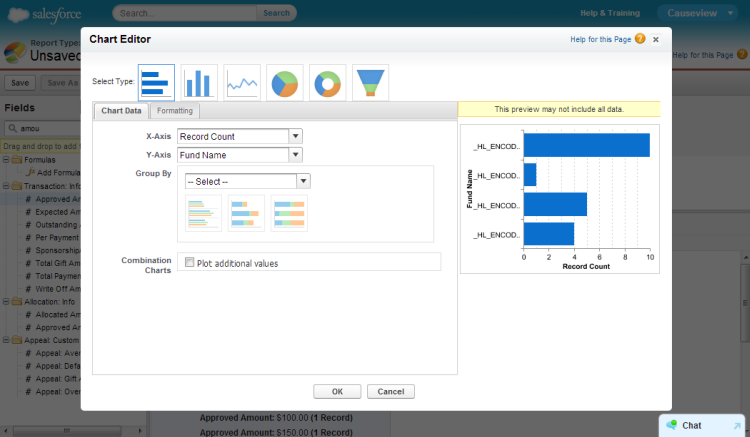 The report customization interface is divided into three main areas: filters, fields, and the report preview. The filter area allows you to specify types of saved information that you would like to show or hide in the report. This can be achieved using the “Show” option, where you can choose to report on information saved to Causeview from your Causeview user, your Causeview user team, or all information saved in Causeview. The “Date Field” also acts to filter the information in the report to a specific time range. You can also filter the information in your report using filters specific to the saved information in Causeview. 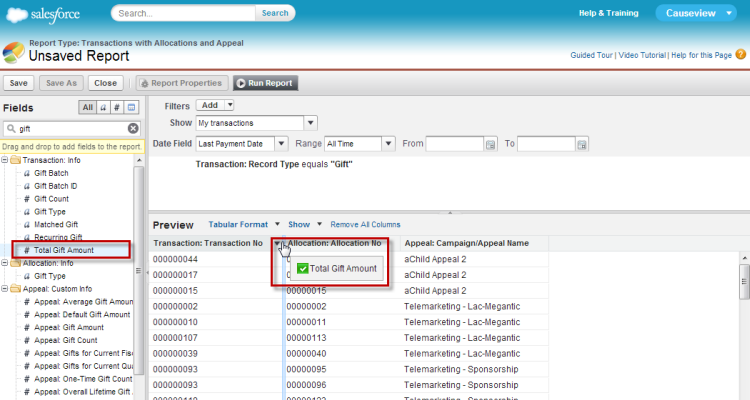 That means, for example, that you can create a filter so that only transactions saved as gifts appear in my report. To create a filter click on the Filters “Add” button. For each filter you must choose a field (one line of information in Causeview), an operator (for example, equals, is greater than, or is not equal to), and the value or text that should (or should not) appear in the field. To create a filter that only allows “Gift” transactions in the report, the field should be “Transaction: Record Type”, the operator should be “equals”, and the value should be “Gift”. The fields area of the report customization interface is used to add or remove specific information from the report by dragging and dropping fields into the report preview, or into the filter area to create a new filter. The quick find search interface makes it easier to locate fields from a long list. You can choose to make all fields visible, or narrow your list to text fields (the “a” button), number fields (the “#” button) or date fields (the calendar button). If you would like to use a field in your report, simply click on the field name, drag it over to the report, and drop it where you would like to place it. Alternately, you can drag and drop it into the list of filters to create a new one. The Preview area of the report customization interface is largely used to view the output of the report and place new fields into the report. However it’s very important to pay attention to the format option, which is in this area. The default report format for a new report is a simple table. A table can hold many columns of information and is useful for displaying data, but it cannot generate a graphic chart. Many of the existing report templates use a summary format, which is able to generate a chart. A more complex matrix format also exists, and can create charts. In the summary and matrix formats you can examine how different fields interact with one another. If you have created a summary or matrix format report, you can create a graphic chart to represent the information from your table and make it easier to understand. Simply click on the “Add chart” button to open the chart editor. The chart editor allows you to select from several chart types, and adjust the axises and information sources for the chart. When your report is complete you can save the report as a template. If your report was a new custom report, you can use the “Save” button to create a new template. If you chose to customize an existing report template, you can choose to “Save” over the previous template, or you can click “Save As” to create a new template with your customizations. You can also run the report directly from the report customization interface to view all of the same functions and options that are available when you run an existing report template, like exporting the data or scheduling automatic reports.